Everything had been planned down to the smallest detail. Our projects were all lined out, and the food was purchased. The red carpet and local dignitaries were all prepared for the official visit from Jill Osborn, the national coordinator for the PIT program, and Linda Feldman, the Washington office public relations representative. The rain came, but that was okay; it had been a dry summer, and we needed the moisture. We had the orientation for the volunteers and even conducted a mini tour of the ranch. Then it began to snow. That was all right, too—it wasn’t going to last long, and we could watch the video of the Swetts farming their ranch. The snow began to stick. This was a bit of a problem because all of our projects were outside. Then snow began to pile up. We decided it was time to leave the ranch. Even then, several of the vehicles had a hard time getting back to the highway. It was about this time that most of us decided we wouldn’t be camping out on this project. The roads had not been plowed, and even 4-wheel-drive vehicles were sliding off into the trees. The snow did scare off a couple of volunteers. Then the trail crew showed up asking if we had anything for them to do. Now we had to find work for about 20 people. But Lynne Ingram, then visitor interpretive specialist at Swett Ranch, was prepared, and she had a single-spaced list of projects covering about six pages. So we moved down the list. We cleaned out the workshop and made it more accessible for tours. She sent the rail crew to the attic of the second house—a place no human has entered in decades! They brought out tons of stuff, including a few treasures, some unidentifiable things, and even some relatively recent material. Tack was cleaned, and a mattress and pillows were created. Snow continued the second day, but that didn’t stop the outside work. For years, Lynne has dreamed of building an outhouse. This became PIT volunteer Greg Duffy’s mission, his obsession. He carefully examined the old outhouse, studied the video, and interviewed individuals who may have utilized it—all to create the outhouse of Lynne’s dreams. Trails were improved to the blacksmith shop and around the root cellar and spring house. Lynne ordered several thousand trees removed to create a landscape similar to when Oscar and Emma Swett lived at the ranch. Now the problem was what to do with the huge mounds of tree debris that had been created! Finally, after one year, two weeks, and three days, the root-cellar roof was finished. 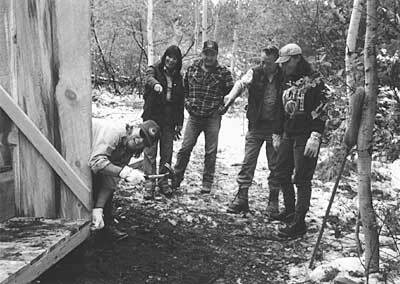 Tin was used to make it waterproof, chicken wire was placed all around to make it rodent proof, and poles were placed to make it moose proof. Now we have to do something about the inside! That night, Bill Hurst, a former ranger on the Manila District (1939–1945) and regional forester in Region 3 (Southwest), stopped by for dinner. For nearly three hours, he told us stories about everything from skiing the telephone line, rationing during World War II, and of course outhouses, to the Milagro Beanfield War, which occurred while he was regional forester. We enjoyed it so much that we coerced him into visiting the ranch the next morning so that Lynne could record some of his stories. His visit was unexpected—the current district ranger had run into him at the Flaming Gorge Dam visitor center and invited him over for dinner. What an amazing, but very fortunate visit. Wednesday it was supposed to clear up, but we still got some snow. Work progressed on the outhouse, and in the afternoon we did start on the main project—the blacksmith shop roof. We learned that a pulaski is actually the best tool for removing a roof covering of cedar bark and clay. That is, as long as you don’t chop through the rotten roof membrane and fall to the floor below. The PIT volunteers attempted to tour some scenic areas, but the snow forced them home early. Our visitors discovered that our broad scenic vistas are best seen under a clear sky. With visibility of 100 feet in a snow storm, holding up a postcard and looking into the gray haze is just not the same. Thursday it actually started to clear up. Everything was removed from the blacksmith shop, and the roof was cleaned and repaired to withstand the winter. It will be replaced in 1997. The outhouse was finished, and life was good! Friday was wonderful! It was sunny and warm. We cleaned the blacksmith shop artifacts and finished cleaning out the inside of the building. Then we put everything back! Ted Leflet, FS employee and expert in construction matters, fixed the workshop roof by placing barbed wire on the ridges. No wait, he did that to the root cellar; he placed shingles on the workshop roof. PIT volunteer Robin Finlay-Busker commended Tex for learning a new joke over the past year. Then we cleaned up and wondered why we had to leave when the weather was so pleasant. Three PIT volunteers, two summer interns, six FS employees, the trail crew, the fire crew, two visiting dignitaries, the regional archaeologist, the regional director of recreation and lands, a district ranger, a forest supervisor, a former ranger and regional forester, a handful of moose, three deer, several marmots, and a couple of fishermen from Connecticut all participated in the work at Swett Ranch. 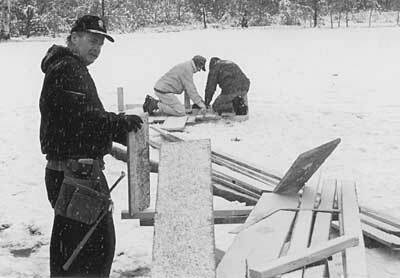 This was a very memorable project, what with the snow, the official visitors, the stories, and FS seasonal employee Angie Edwards’s forgetting the coffee. But we also accomplished much more than we had ever hoped. Not only did we protect a couple of buildings, but we made giant leaps in making the ranch more accessible and enjoyable to the public. They can now see more of the tools and items that Oscar used and experience the interiors of more of the ranch buildings. It was an extremely successful project!